On the environment, the opportunity to throw some real institutionalist punches and ram climate legislation through the Senate passed us by in June, when the House passed the bill and the health care debate hadn’t taken over everyone’s attention spans. Being individualists, the Obama-ites failed to think about the institutional structure of the Senate and the fact that it doesn’t take on more than one big bill at a time, as well as about the institutions of other governments who would not, despite their general admiration for Obama, be duped into taking a handshake from him in December instead of real policy commitments to reduce emissions. That said, there are occasional fleeting moments where it seems that Obama has grown savvy to these problems with his radical individualism. That’s why, as I reported in Fortune today, he’s using the institutions he still has power over (the executive agencies) to regulate individual industries in lieu of getting a comprehensive bill. In some ways, discretionary regulation beats Congressional oversight–career bureaucrats tend to be less beholden to lobbyists. On the other hand, discretionary regulation tends to be less economically efficient in the policies it produces, because industries are considered piecemeal and without proper attention to the way they interact in the macroeconomy. Furthermore, discretionary regulation is, well, discretionary, and doesn’t have any value once power changes hands. Congressional policies, on the other hand, are very hard to undo once they’re in place. Still, is this better than nothing? Hell, yeah. The madness of Qaddafi aside, there was some value to this weeks UN and G20 meetings: they introduced the world to Barack Obama’s foreign policy. Readers of this blog will know that I am skeptical of 44, because I see him as representing the rise of the liberal-tarian left at the expense of liberal institutionalists like myself. In foreign policy, however, Obama has endorsed the institutionalist path, memorably promising during the campaign that he would negotiate with any and all world leaders instead of taking unilateral action and would engage international institutions to combat international problems like climate change. I had struggled to reconcile this with his professed love of diffuse power. Now I understand: Obama thinks of governance as consensus building amongst individuals. As a result, his vision of international institutions is much the same as his vision of Congress, as a place we go to engage in banter until we arrive at broad and general consensus, rather than as a place for realpolitik dealmaking around concrete specifics. Here’s an interesting new phenomenon: executives going to Washington to beg for regulation. C-suiters from Google, Starbucks, Nike, Sun Microsystems, Timberland and Levi’s are encouraging Congress to pass legislation (likely under Obama) that will force them to get more energy-efficient and bring us closer to a carbon-neutral economy. Some of these companies have been hit hard for their social irresponsibility before: remember Nike and the sweatshop debacles of the 1990s? Some of them have great PR, but belong to industries that make a massive footprint on our environment–home electronics like computers make up 20% of our energy consumption. So this shift in rhetoric, if taken up by legislators, is notable. But it strikes me as strange too: if all these executives recognize that consumers now care about the sustainability of the brands they buy, why not just dive in to the emerging market, instead of begging government to force all your competitors to come with you? I’m in favor of mild government coercion on this issue because I don’t think there are enough pro-environment executives in the big emission sectors (ahem, oil), but that doesn’t explain the behavior of those who do see the pot of gold and still need the government to push them over the rainbow. It reminds me of this time in middle school when my kid sister bombed a test, knew she needed to study more, and begged my mother to ground her. I didn’t get it then, and I don’t get it now. 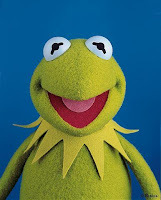 You know, I always had a thing for Kermit and I was thinking of his famous quip today when I saw this story about UPS. Apparently, the dudes in brown are going “green,” by telling all their drivers to take delivery routes with only right turns. That way, they won’t waste any gas waiting to turn left. Get real, UPS. Going green, for real, isn’t about making little tweaks like that, though they help. It will require rethinking the big picture of how we live–it means deciding to call a local store near your grandmother’s house to have them deliver her a gift (by bike), INSTEAD of buying a present and shipping it via UPS. Not to mention that UPS has had this program for two years, but managed to make it a new story this weekend as part of the global warming media hype. Then again, I’m sometimes afraid to beat up on companies for greenwashing for fear they’ll stop trying altogether.